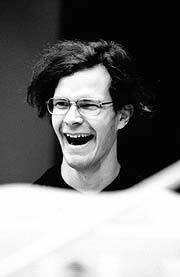 The founding member of Ensemble Ambrosius, Ere Lievonen is a Finnish organist, harpsichordist, pianist and composer. As a performer, he is specialized both in early and contemporary music. He has performed in several European countries and the USA, and appeared on numerous contemporary and early music festivals. After studying at the Sibelius Academy in Helsinki, he moved to the Netherlands to study further with Jacques van Oortmerssen (organ), Jacques Ogg and Annelie de Man (harpsichord), and Rafael Reina (composition), among others. Alongside with his solistic cereer, Lievonen is an active chamber musician. The ensembles thet he is involved with include Baroque ensembles ALGO and "Beauty and the Beast" and contemporary groups Hexnut and Scala. Lievonen has also played keyboards in various professional orchestras, such as Finnish Rso, Helsinki Philharmonic and Sinfonia Lahti. Since 2009 he has been the organist of the unique microtonal 'Fokker' organ in Amsterdam.